, a celebrated Athenian, of whom Barthelemi has justly remarked, that some historians have stigmatized his memory with every reproach, and others have honoured it with every eulogium, without its being possible for us to charge the former with injustice, or the latter with partiality. He was born in the eighty-second olympiad, | about the year 450 B. C. Clinias, his father, was descended from Ajax of Salamis, and his mother, the daughter of Megacles, was of the family of the Alcmteonides. In his person, while a youth, he was beautiful, and when a man, remarkable for his comeliness; his fortune was large beyond most of the nobility of Athens. His abilities were so great, that an ancient author (C. Nepos) has asserted that nature in him had exerted her utmost force, since, whether we consider his virtues or his vices, he was distinguished from all his fellow-citizens; he was learned, eloquent, indefatigable, liberal, magnificent, affable, and knew exactly how to comply with the times; that is, he could assume all those virtues when he thought proper; for, when he gave a loose to his passions, he was indolent, luxurious, dissolute, addicted to women, intemperate, and impious. Socrates had a great friendship for him, corrected in some degree his manners, and brought him to the knowledge of many things of which he would otherwise have remained ignorant: he also prevented the Athenians from resenting many of those wanton acts of pride and vanity which he committed when a lad. 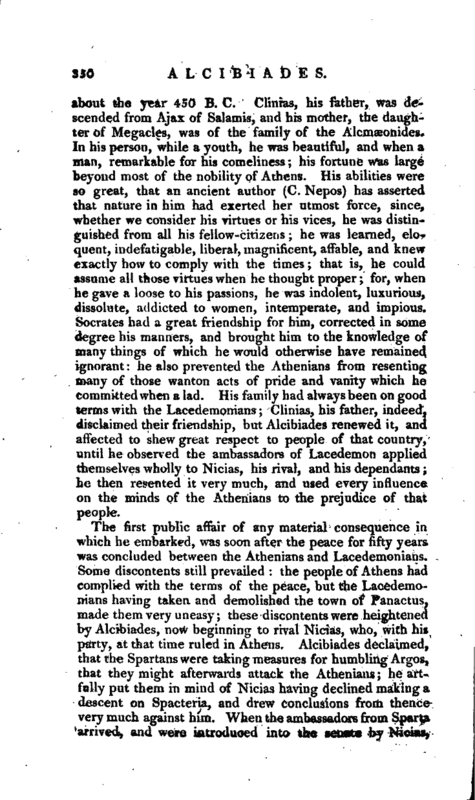 His family had always been on good terms with the Lacedemonians; Clinias, his father, indeed, disclaimed their friendship, but Alcibiades renewed it, and affected to shew great respect to people of that country, until he observed the ambassadors of Lacedemon applied themselves wholly to Nicias, his rival, and his dependants; he then resented it very much, and used every influence on the minds of the Athenians to the prejudice of that people. The first public affair of any material consequence in which he embarked, was soon after the peace, for fifty years was concluded between the Athenians and Lacedemonians. Some discontents still prevailed: the people of Athens had complied with the terms of the peace, but the Lacedemonians having taken and demolished the town of Panactus, made them very uneasy; these discontents were heightened by Alcibiades, now beginning to rival Nicias, who, with his party, at that time ruled in Athens. Alcibiades declaimed, that the Spartans were taking measures for humbling Argos, that they might afterwards attack the Athenians; he artfully put them in mind of Nicias having declined making a descent on Spacteria, and drew conclusions from thence very much against him. When the ambassadors from Sparta arrived, and were introduced into the senate, by Nicias, | on their retiring, Alcibiades, as the old friend of their nation, invited them to his house, assured them of his friendship, and persuaded them to declare that they were not vested with full powers (although they had in the senate declared they were), to avoid making unreasonable concessions. When, therefore, they first appeared in the forum, Alcibiades addressed himself to the people, saying, “You, see, my countrymen, what credit ought to be given to these Lacedemonians, who deny to you to-day what they affirmed yesterday.” The people then refused to hear them. Alcibiades next promoted a league with the Argives, in order to keep the war at a distance, in case the feuds between Sparta and Athens were revived. This happened in, the twelfth year of the Peloponnesian war. The next summer he was invested with the command of a considerable army, passed into the territory of Argos and to Patrae, and at both places laboured to persuade them to build walls towards the sea, to enable them to receive succours from Athens; but jealousy of the Athenian power prevented them. No action took place this year. Two years after, some dissentions taking place at Argos, Alcibiades sailed with a fleet of twenty ships into their territories, to assist his friends, and put an end to their disputes. To effect this, he caused three hundred of the inhabitants, who were suspected of favouring the Lacedemonians, to be seized and carried away. After this, he sailed to the island of Melos, which, although small and of inconsiderable force, had always acted with inflexible obstinacy against the Athenians. Alcibiades laid siege to it; but finding the siege attended with difficulties, he turned it into a blockade, and leaving a considerable body of forces there, returned to Athens; the place afterwards surrendered at discretion. The Athenians, in the sixteenth year of the war, determined to send a fleet into Sicily, to the assistance of the Egistines; Nicias was appointed to command, and Alcibiades and Lamachus were his colleagues. During the preparations for this expedition, an accident happened which put the whole city of Athens into confusion: the Hermae, or statues of Mercury, of which there were a multitude in the city and neighbourhood, were all defaced in one night, nor could the authors of this fact be discovered, notwithstanding a proclamation was issued, offering impunity and a reward for the informer; yet, in consequence of a clause | therein, inviting any person of what condition soever to discover any former sacrileges, some servants and slaves deposed, that a long time before, certain young men, heated with wine, had ridiculed some religious mystery, and that Alcibiades was among them. His enemies immediately commenced a prosecution against him, to which Alcibiades offered to answer, asserting his innocence, and protesting against accusations brought against him while he should be absent. His enemies, determined to attempt his destruction, procured others to move that he should have liberty to depart on his command, and that, after his return, a day of trial should be assigned him; to this proposition he was unwillingly obliged to consent. The fleet sailed; but they had not been long in Sicily before orders from Athens arrived, directing Alcibiades to return and take his trial; the whole city being in a confusion on the affair of defacing the Hermae. 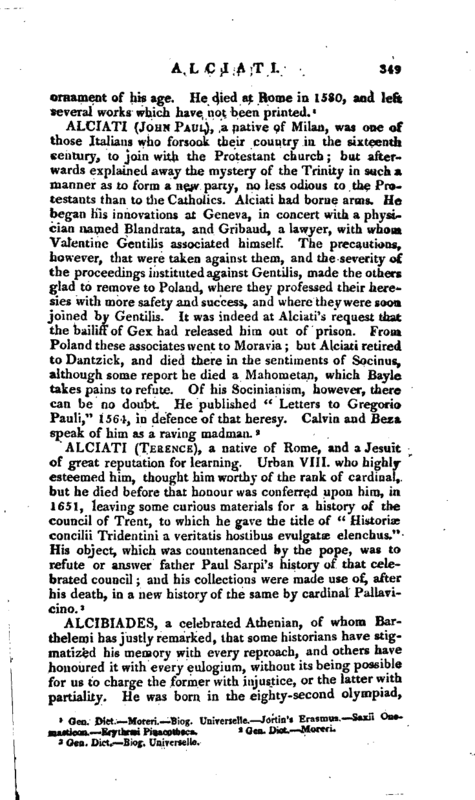 This was probably a scheme of the enemies of Alcibiades, to ruin the mighty interest, which his birth, fortune, and accomplishments had gained him in Athens: to effect -their purpose, they also reported that he had entered into a conspiracy to betray the city to the Lacedemonians, and that he had persuaded the Argives to undertake something to their prejudice. 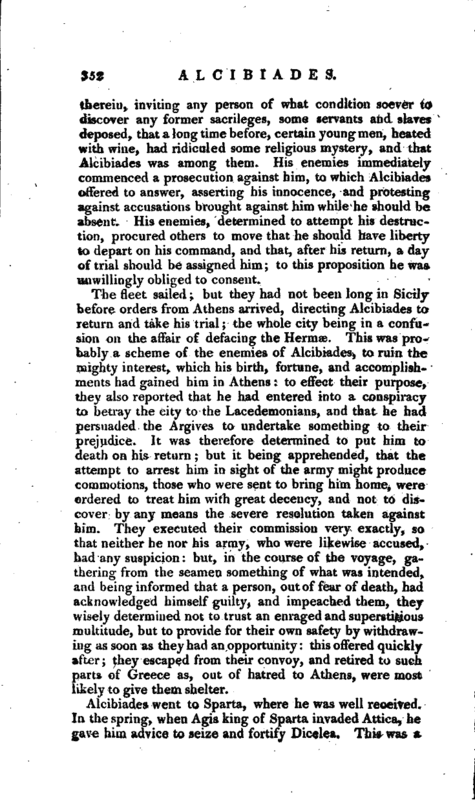 It was therefore determined to put him to death on his return; but it being apprehended, that the attempt to arrest him in sight of the army might produce commotions, those who were sent to bring him home, were ordered to treat him with great decency, and not to discover by any means the severe resolution taken against him. They executed their commission very exactly, so that neither he nor his army, who were likewise accused, had any suspicion: but, in the course of the voyage, gathering from the seamen something of what was intended, and being informed that a person, out of fear of death, had acknowledged himself guilty, and impeached them, they wisely determined not to trust an enraged and superstitious multitude, but to provide for their own safety by withdrawing as soon as they had an opportunity: this offered quickly after; they escaped from their convoy, and retired to such parts of Greece as, out of hatred to Athens, were most likely to give them shelter. 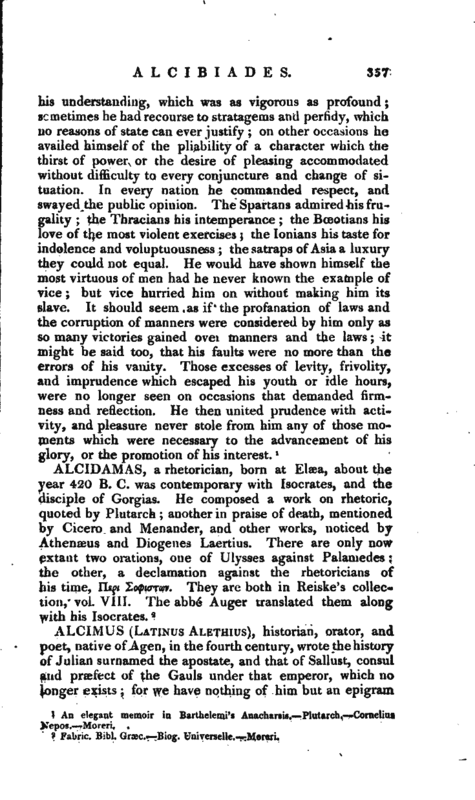 Alcibiades went to Sparta, where he was well received. In the spring, when Agis king of Sparta invaded Attica, he gave him advice to seize and fortify Dicelea. This was a | severe stroke on the Athenians; but their misfortunes fell much heavier on them in Sicily, and their allies began to waver. 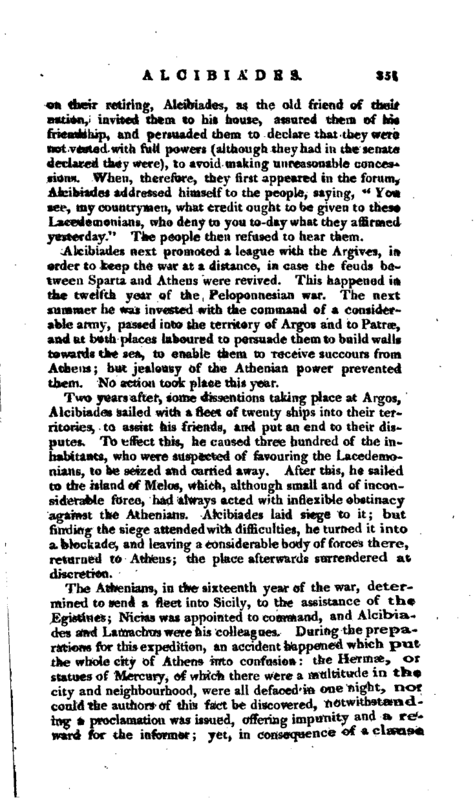 They afterwards had some slight successes at sea, which discouraged the Peioponnesians; but Alcibiades exerted his eloquence to persuade them to continue the war; he advised them to send a small fleet to Ionia, promising to engage the cities to revolt from the Athenians, and to negociate a league between Sparta and theking of Persia, the advantages of which he pointed out to them. The Lacedemonians entering into his measures, he passed over into Ionia, and there actually effected what he had promised. He also found means to draw Tissaphernes, the king of Persia’s lieutenant, into a league with them. The Spartans, however, were displeased with the terms of it, and seeking to have them altered, the Persians likewise grew displeased. Alcibiades did not long continue in favour with the Spartans; and having debauched the wife of Agis, that prince conceived the most inveterate hatred against him, and persuaded the Lacedemonians to send orders, to their general in Ionia to put the Athenian to death. Alcibiades gained some intelligence of this, retired to Tissaphernes, and laying aside the Lacedemonian, as he had before done the Athenian, became a perfect Persian. By the politeness of his address, he gained so much on Tissaphernes, although a professed enemy to all Greeks, that he gave his name to his gardens of pleasure, after he had spent immense sums in adorning them; they were afterwards called Alcibiades. When the Athenian saw that Tissaphernes placed a confidence in him, he gave him much information respecting the affairs of Greece; told him that it was not the interest of the Persian monarch that Athens should be destroyed, but that she and Sparta should be supported as rivals to each other, and that then the Greeks would never have an opportunity to turn their united arms against his master; but added, that if it should become necessary to rely on one of them, he advised him to trust to Athens, because she would be content with the dominion of the sea; but that the pride of the Spartans would always stimulate them to new conquests, and excite in them a desire of setting the Greek cities in Asia at liberty. Tissaphernes approving of these counsels, Alcibiades wrote privately to some officers of the Athenian army at Samos, intimating that he was treating with the Persian on their behalf; but would not return to his native country | until the demoeratical form of government was abolished. The reasons he advanced for this measure were, that the Persian king hated a democracy, but would immediately assist Athens, if the government was put into the hands of a few. These fickle people, the Athenians, prone to novelty, dissolved the -democracy, and sent deputies to treat with Alcibiades and Tissaphernes; and, in case the terms offered by the Persian vtere reasonable, they were to declare that the Athenians would vest the sovereignty in the hands of a few. Before the deputies arrived, Alcibiades had discovered tha.t Tissaphernes did not incline to keep the Athenians on any terms; therefore, he set up such high conditions in the name of the Persians, that the Athenians themselves broke off the treaty. The democracy of Athens was, however, destroyed, and a new form of government was set up. This did not give general satisfaction the army at Samos declared for the democracy and, at the request of their general Thrasybulus, recalled Alcibiades. On his return, he made a most eloquent speech to the army, shewing them the true source of his misfortunes, the injustice of his countrymen, and the danger attending the state. The soldiers, pleased with his harangue, created him general, with full power, and proposed sailing immediately to Athens to restore the ancient form of government. Alcibiades opposed this extravagant, measure; and told them, that since they had chosen him general, he must return to Tissaphernes to prepare things to make a speedy end of the war: accordingly, with the consent of the army, he departed. When he came to Tissaphernes, he extolled the great power of the Athenians; and, by this means, made himself formidable to the one party, and necessary to the other. 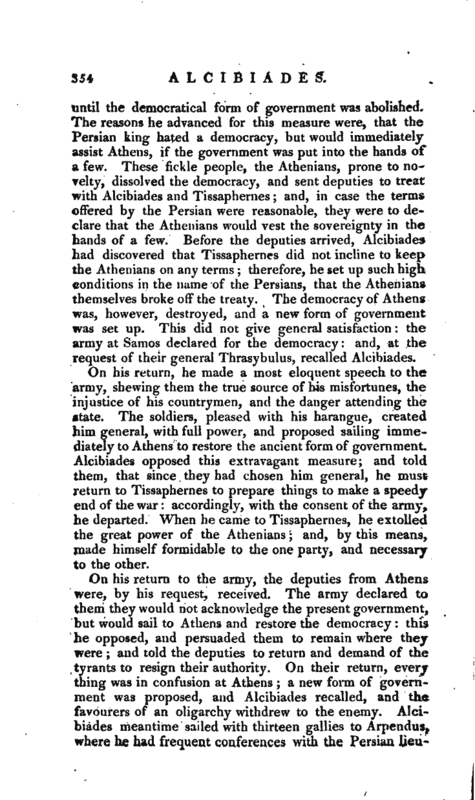 On his return to the army, the deputies from Athens were, by his request, received. The army declared to them they would not acknowledge the present government, but would sail to Athens and restore the democracy: this he opposed, and persuaded them to remain where they were; and told the deputies to return and demand of the tyrants to. resign their authority. On their return, evert thing was in confusion at Athens; a new form of government was proposed, and Alcibiades recalled, and the favourers of an oligarchy withdrew to the enemy, Alcibiades meantime sailed with thirteen gallies to Arpendus, where he had frequent conferences with the Persian | lieutenant. 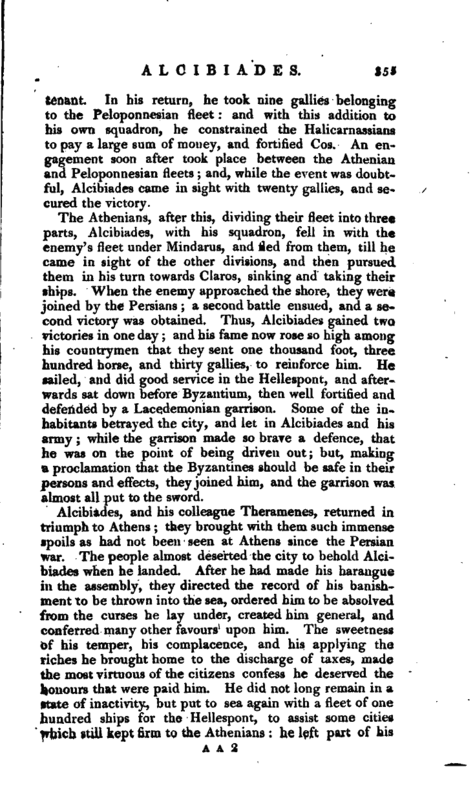 In hjs return, he took nine gallies belonging to the Peloponnesian fleet: and with this addition to his own squadron, he constrained the Halicarnassians to pay a large sum of money, and fortified Cos. An engagement soon after took place between the Athenian and Peloponnesian fleets; and, while the event was doubtful, Alcibiades came in sight with twenty gallies, and secured the victory. The Athenians, after this, dividing their fleet into three parts, Alcibiudes, with his squadron, fell in with th enemy’s fleet under Mindarus, and fled from them, till he came in sight of the other divisions, and then pursued them in his turn towards Claros, sinking and taking their ships. When the enemy approached the shore, they were joined by the Persians; a second battle ensued, and a second victory was obtained. Thus, Alcibiades gained ttvo victories in one day; and his fame now rose so high among his countrymen that they sent one thousand foot, three hundred horse, and thirty gallies, to reinforce him. He sailed, and did good service in the Hellespont, and afterwards sat down before Byzantium, then well fortified and defended by a Lacedemonian garrison. Some of the inhabitants betrayed the city, and let in Alcibiades and his army; while the garrison made so brave a defence, that he was on the point of being driven out; but, making a proclamation that the Byzantines should be safe in their persons and effects, they joined him, and the garrison was almost aliput to the sword. Alcibiades, and his colleague Theramenes, returned in triumph to Athens; they brought with them such immense spoils as had not been seen at Athens since the Persian war. The people almost deserted the city to behold Alcibiades when he landed. After he had made his harangue in the assembly, they directed the record of his banishment to be thrown into the sea, ordered him to be absolved from the curses he lay under, created him general, and conferred many other favours upon him. The sweetness of his temper, his complacence, and his applying the riches he brought home to the discharge of taxes, made the most virtuous of the citizens confess he deserved the honours that were paid him. He did not long remain in a state of inactivity, but put to sea again with a fleet of one hundred ships for the Hellespont, to assist some cities still kept firm to the Athenians he left part of his | fleet under Antiochus, with strict orders not to engage; but the latter disregarded his instructions, and was defeated. 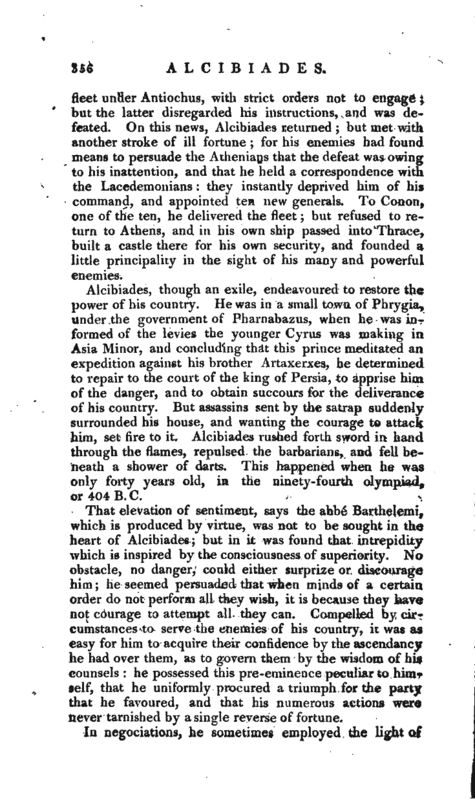 On this news, Alcibiades returned; but met with another stroke of ill fortune; for his enemies had found means to persuade the Athenians that the defeat was owing to his inattention, and that he held a correspondence with the Lacedemonians: they instantly deprived him of his command, and appointed ten new generals. To Conon, one of the ten, he delivered the fleet; but refused to return to Athens, and in his own ship passed into Thrace, built a castle there for his own security, and founded a little principality in the sight of his many and powerful enemies. Alcibiades, though an exile, endeavoured to restore the power of his country. He was in a small town of Phrygia, Under the government of Pharnabazus, when he was informed of the levies the younger Cyrus was making in Asia Minor, and concluding that this prince meditated an expedition against his brother Artaxerxes, he determined to repair to the court of the king of Persia, to apprise him cf the danger, and to obtain succours for the deliverance of his country. But assassins sent by the satrap suddenly surrounded his ho^use, and wanting the courage to attack him, set fire to it. Alcibiades rushed forth sword in hand through the flames, repulsed the barbarians, and fell beneath a shower of darts. This happened when he was only forty years old, in the ninety-fourtn olympiad, or 404 B.C. That elevation of sentiment, says the abbe Barthelemi, which is produced by virtue, was not to be sought in the heart of Alcibiades; but in it was found that intrepidity which is inspired by the consciousness of superiority. No obstacle, no danger, could either surprize or discourage him; he seemed persuaded that when minds of a certain order do not perform all they wish, it is because they have not courage to attempt all they can. Compelled by circumstances to serve the enemies of his country, it was as easy for him to acquire their confidence by the ascendancy he had over them, as to govern them by the wisdom of his counsels: he possessed this pre-eminence peculiar to himself, that he uniformly procured a triumph for the party that he favoured, and that his numerous actions were never tarnished by a single reverse of fortune. An elegant memoir in Barthelemi’s Anaeharsis.—Plutarch.—Cornelius Nepos.—Moreri.